Hear the blasts of grenades and the rattling of machine guns as you get a first-hand view of what combat was like in the Pacific Theatre of World War II. This thrilling experience is only available at the National Museum of the Pacific War in Fredericksburg’s Pacific Combat Zone. On select weekends from March through November, the museum hosts World War II living history demonstrations that fully immerse you in the sensations of battle. 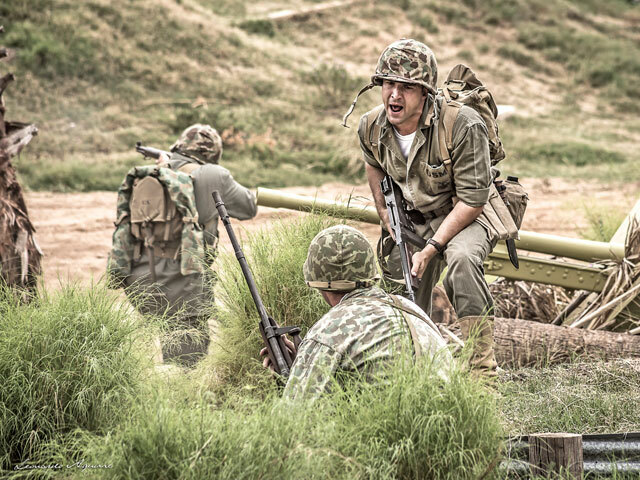 The Pacific Combat Zone’s battle reenactments provide a showcase of the equipment, tactics, and weapons used by both sides during the war. Feel the searing heat of a flamethrower and see such military vehicles as the LCVP Higgins amphibious landing craft and a M3 Stuart tank. From your seat in the amphitheater, you’ll have a fantastic view as U.S. forces fight to capture fortified positions from the Imperial Japanese Army. The recently renovated battlefield includes a Japanese-controlled hill and trench fighting positions, providing an immersive and educational experience you won’t find anywhere else. These reenactments typically last for about 1 hour and ear plugs are provided. Shows start at 10:30 a.m. and 2 p.m. on the Saturday and Sunday of each show weekend. Read on to see a list of the upcoming show dates for this year and get your tickets today. Show dates and prices are subject to change. Please check the National Museum of the Pacific War’s website for the most up-to-date information before making plans.